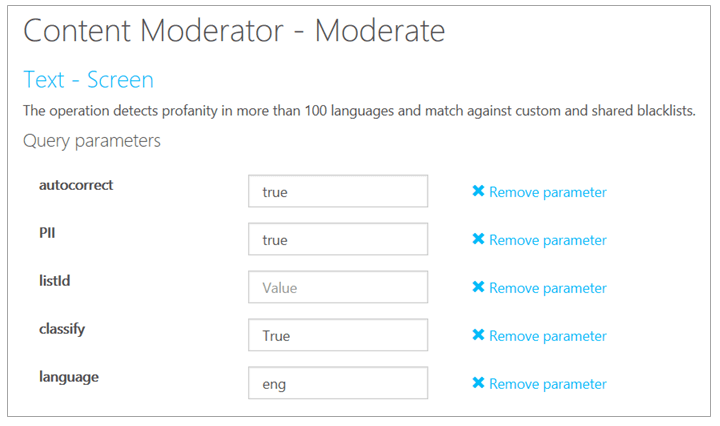 Use the Text Moderation API in Azure Content Moderator to scan your text content. The operation scans your content for profanity, and compares the content against custom and shared blacklists. Before you can test-drive the API in the online console, you need your subscription key. This is located on the Settings tab, in the Ocp-Apim-Subscription-Key box. For more information, see Overview. Go to the Text Moderation API reference. The Text - Screen page opens. For Open API testing console, select the region that most closely describes your location. The Text - Screen API console opens. Select the query parameters that you want to use in your text screen. For this example, use the default value for language. You can also leave it blank because the operation will automatically detect the likely language as part of its execution. For the language parameter, assign eng or leave it empty to see the machine-assisted classification response (preview feature). This feature supports English only. For profanity terms detection, use the ISO 639-3 code of the supported languages listed in this article, or leave it empty. For autocorrect, PII, and classify (preview), select true. Leave the ListId field empty. For Content-Type, select the type of content you want to screen. For this example, use the default text/plain content type. In the Ocp-Apim-Subscription-Key box, enter your subscription key. In the Request body box, enter some text. The following example shows an intentional typo in the text. The invalid social security number in the following sample text is intentional. The purpose is to convey the sample input and output format. Is this a grabage or crap email abcdef@abcd.com, phone: 6657789887, IP: 255.255.255.255, 1 Microsoft Way, Redmond, WA 98052. These are all UK phone numbers, the last two being Microsoft UK support numbers: +44 870 608 4000 or 0344 800 2400 or 0800 820 3300. Also, 999-99-9999 looks like a social security number (SSN). In the following example, you see Content Moderator’s machine-assisted text classification response. It helps detect potentially undesired content. The flagged content may be deemed as inappropriate depending on context. In addition to conveying the likelihood of each category, it may recommend a human review of the content. The feature uses a trained model to identify possible abusive, derogatory or discriminatory language. This includes slang, abbreviated words, offensive, and intentionally misspelled words for review. Category1 represents the potential presence of language that may be considered sexually explicit or adult in certain situations. Category2 represents the potential presence of language that may be considered sexually suggestive or mature in certain situations. Category3 represents the potential presence of language that may be considered offensive in certain situations. Score is between 0 and 1. The higher the score, the higher the model is predicting that the category may be applicable. This preview relies on a statistical model rather than manually coded outcomes. We recommend testing with your own content to determine how each category aligns to your requirements. ReviewRecommended is either true or false depending on the internal score thresholds. Customers should assess whether to use this value or decide on custom thresholds based on their content policies. The following response shows the various insights from the API. It contains potential profanity, PII, classification (preview), and the auto-corrected version. The machine-assisted 'Classification' feature is in preview and supports English only. For a detailed explanation of all sections in the JSON response, refer to the text moderation API overview. Use the REST API in your code or start with the text moderation .NET quickstart to integrate with your application.